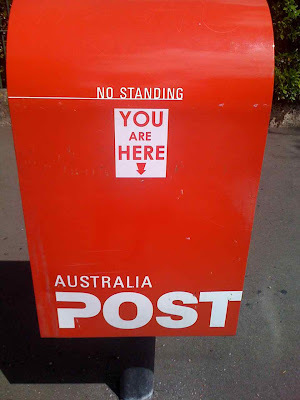 I just ducked out to post a parcel and noticed a cool little guerilla/ street art sticker on the postbox across the road from us. It made me smile because of the message and context, and the way smart street art can add a little fun to the everyday. I will have to keep my eyes peeled to see if more of these stickers pop up around the place, on post boxes or other places. Let me know if you see any too. I also just love the orangey red colour of post boxes. I used to call it fire-engine-red, but our fire engines in Australia are a deeper shade of red really aren't they? I think I'll call it post-box-red from now on. I'm Shannon's cousin and the compassion project is done by our 2nd cousin in California. Love the fabric necklaces too.